Heavy rains have brought extensive flooding across Alberta and here in Calgary, impacting multiple communities and forcing thousands of people from their homes. . I finally managed to build up a Velo Routier up for myself. I wanted a bike ready for commuting and multi-day unsupported rides. No camping for me, but I need the capacity to carry clothing, and gear for any combination of snow, hail or torrential rain and temperatures that range from -10C to +30 C which are all possible on the same day out here in Alberta where we live and ride! I went to my parts bin and put together a mix of classic and modern. I stuck with our stock wheeset (Jetline rims, SS 15g spokes and Access seal hubs) but went with a bit heavier rubber with Grand Bois Herte tires and with our ultralite Maxxis inner tubes. Other stock parts inclulded a Luxe crankset (46T-30T), Kalloy seat post and my nicely broken-in Gryes leather saddle which I moved off of our prototype 2 bike. I decided to have a little fun with the drive train with a Huret Jubilee long-cage rear derailleur, Mavic front derailleur and Simplex Retro-friction shifters. I mounted the shifters in a nod the 1970’s weight weenies, front shifter on the downtube and rear shifter on a Dia-Comple bar-end pod – saves a few grams on a shorter cable run and one less barend shifter pod :-). I used a SRAM 8-speed chain and cassette which worked great with the old Huret and Mavic derailleurs and have the benefit of being available in small town shops in the case of a repair. Stopping is supplied by Mavic Raid brakes. Greater fender clearance and cool factor aside, they are noticeably more flexible than the Dia-compe 750. 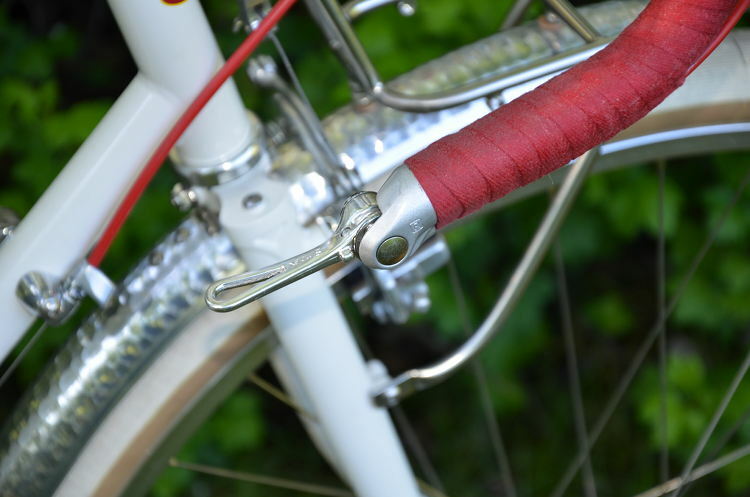 While I want to match the Raid brakes with classic Mafac half-hood levers, I stuck with the Dia-Compe DC204QC brake levers as I have not been able find a pair with hoods in decent condition. To think those levers were as common and unloved as dandelions when I was a kid! I mounted the front and rear rack in traditional constructeur fashion to the top of the fenders with bolts and leather washers. A Velo-Orange decaleur mounted to a Stronglight A9 needle-bearing headset with TTT handlebars/stem and shellaced Tressostar cloth tape. I have no idea how anyone wraps a set of bars with 2 rolls Tressorstar, I always end up using 3 rolls. I’ll be riding it my annual Rocky Mountain 4-day extended weekend tour starting this Saturday. This year is the our easy route with four 100 km days, two of which are pretty flat and two day that end at the Radium Hot springs. June is the wettest month of the year on the eastern slopes but traffic is light as the tour buses and RV’s are not out in full force yet.